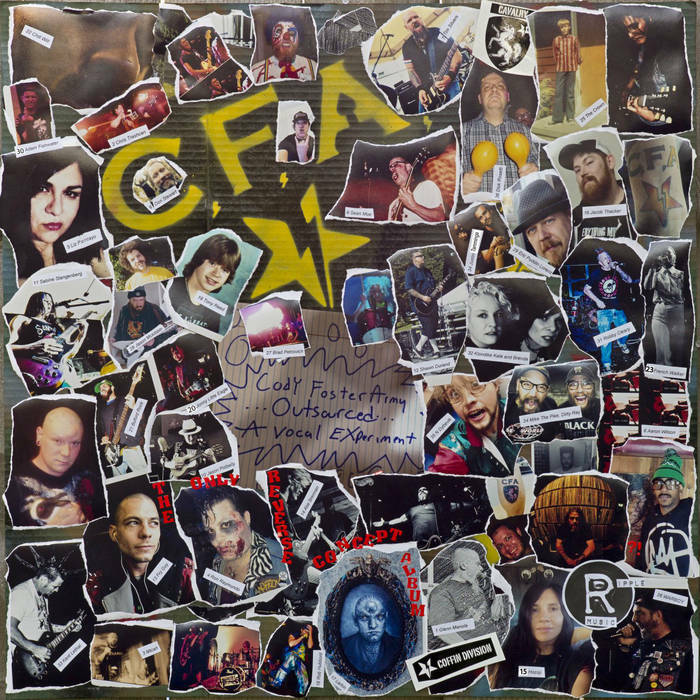 Ripple Music has announced the release of ‘CFA Outsourced: A Vocal Experiment’, an exciting new thrash punk project from rock ’n’ roll outsiders The Cody Foster Army. Comprising of 36-tracks, each consisting of behemoth-sized brashness and foul-mouthed, raw punk rock attitude, this unique compilation throws back to the days when telling the man where to go was the only way to get things done. Powered by schizoid front man Cody Foster who recruited an army of talented vocalists to sacrifice both their vocals chords and sanity, over thirty+ tracks we’re treated to individually written songs, performed to a familiar instrumental track… with each singer throwing down their furious interpretation however they see/hear fit. With the majority of songs coming in at around the 1 minute mark, probably the average song time for thrash punk if we’re honest, the fact that Ripple Music nurtures such creativity, shows more balls than a Lenny Kravitz concert in terms of not being afraid to push the boundaries, as well as being brutal and in your face throughout the 36 songs. The idea was spawned from a practice regularly indulged in at your average Cody Foster Army live show, where the band pulls punters up to improvise vocals to a one minute frenzied piece of music. Like Xeroxing a Xerox, each track trades in like-for-like blows of punk rock fury through vocal renditions by Liz Porcayo (Skies Below), Tony Reed (Mos Generator), Tim Silvers (Antihero) and many more. Making CFA Outsourced: A Vocal Experiment a project conceived through noise and community participation. A testimonial perhaps to the true spirit of rock-n-roll and reminder of just how carefree, tumultuous, and fun punk rock can truly be. Ripple Music is a California based independent record label founded in 2010 by Todd Severin and John Rancik. The company encompasses a record label, a music publishing business, a marketing, promotion and sales team, and a Distribution for heavy independent bands (Heavy Ripples Distro).